Just before a meeting at a venture capital firm in Boston, Windsor Hanger started to panic. She realized she had nothing to wear for the big sit-down. Lucky for her, she could turn to her two business partners, Stephanie Kaplan and Annie Wang, for help. In a few minutes, the trio of 20-somethings had tossed together a fabulous ensemble. Hanger was off to her meeting in Kaplan’s Express black dress and size 9 flats, along with Wang’s tights, necklace, and orange J Crew sweater. Of course, such teamwork isn’t out of the ordinary for these three, the creators of the online style guide Her Campus Media. That’s how they roll. When one is in need, the others rush in with solutions, whether it’s for couture, marketing plan ideas, or help finishing a sentence in a major presentation. The website covers college-specific topics aimed at women, including fashion and health advice, stories about love and love lost, and tips on how to get good jobs and internships while maintaining a thriving social life. Writers from across the country contribute campus-specific stories. Last week, an article from Tufts University was one of the most popular on the site, along with news from Cornell, Tulane, University of Michigan, and Emerson College. Cathy Cranston, former head of the Harvard Business Review and an adviser for Her Campus, says the site hits an obvious hole in the market, a female demographic that falls somewhere between the Seventeen magazine and Cosmopolitan crowds. It’s a readership that advertisers are desperate to get to. 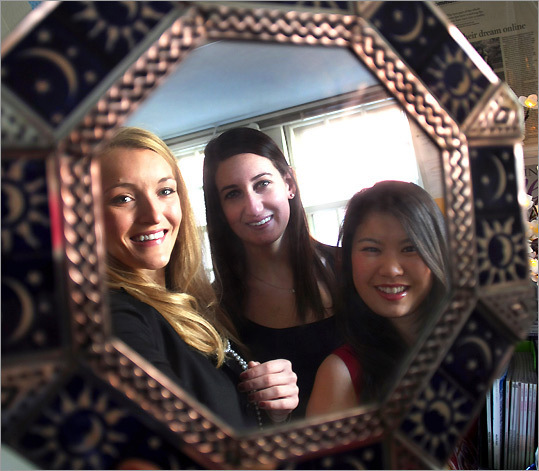 The three founders met at Harvard in 2007, when all were working on another campus publication, and started talking about the Her Campus model. In March 2009, they won a business plan competition at Harvard for student entrepreneurs. By that summer, they were crammed into a New York City studio apartment, plotting. The goal: An online-only publication meant to appeal to smart, successful, and style-conscious college women. By September they were working in their new roomy office space in Harvard Square on Mount Auburn Street. From there, everything exploded. Within a few months, they had 20 other Her Campus sites up, and by that spring, their team of student writers had grown to 750 people. Today, they boast more than 1.5 million hits and 250,000 visitors per month. On a chilly afternoon the three women cheerily worked in their sunny, fourth-floor space that smells of lip gloss, pivoting between their laptops, cellphones, and each other. Hanger, a vision in pink over chic black, with long blond hair, is the dominant talker. Kaplan, 22, a more understated brunette wearing olive-colored clothes, comes in a close second. Wang, 22, in a striped sweater, boots, and leg warmers, is the silent type, and has to be prodded to join the conversation. They are clearly affectionate and supportive, happy to share the credit and talk of each other’s strengths. Hanger, who’s from Asheville, N.C., is president, head of marketing and sales, and runs most of the meetings with advertisers and potential partners. Kaplan, from Newton, is in charge of the content for Her Campus, setting the brand’s tone and managing its satellite editors. Wang, who comes from Dayton, Ohio, is a tech whiz-kid who taught herself how to build the platform that runs the Her Campus sites. “The thing that really makes it all work is that they are different personalities driven by the same unique characteristics,’’ said Jake Duhaime, a recent Emerson graduate, who does some volunteer PR for Her Campus. Joanna Coles, editor in chief of Marie Claire magazine, also noticed that dynamic. She summoned the trio to New York after learning about Her Campus. “I think they are extremely energetic and a very attractive troika of young women who, on the one hand, fascinated me by how serious they are and on the other hand, they humiliate me because when I was that age, I could barely get out of bed in the morning to struggle to my first job, never mind re-creating a [new publishing model] for women on the Web,’’ said Coles. Though they won’t reveal specifics right now, Coles and the Her Campus crew have something brewing — a collaboration that will meld the reach of the two distribution models. What they will say is that it gets back to that notion of how the traditional publications can hit the college demographic. That’s a problem these three most likely won’t have. Swapping clothes for a business meeting is just the start of it. They spend about 60 hours a week together. They know each other’s parents. They travel together on the Bolt bus back and forth to New York for meetings, and stay in the same hotel room when they get there. They are partners but also friends. And to them, that vibe is what makes Her Campus a success. Carlene Hempel can be reached at carlenehempel@hotmail.com.